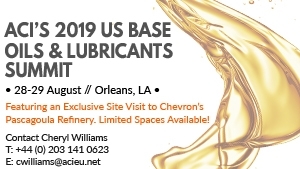 ACI’s 2019 US Base Oils & Lubricants Summit will take place in New Orleans, LA on the 28th & 29th of August, 2019. The two day event will bring together professionals across the lubricant supply chain to address current industry issues, explore new opportunities and network with peers. In addition to the 2 day conference, on 27th August a limited number of conference attendees will receive a unique opportunity to visit the Chevron Pascagoula Refinery. There is no extra charge to attend the site visit, but spaces are limited and will be allocated on a first come - first served basis. Please confirm your attendance to join the site visit when booking to the conference. As an event supporting partner, ACI are offering PetrolPlaza subscribers a 15% discount on their registration. To claim contact Cheryl Williams on + 44 (0)203 141 0623 quoting EBLn2MKT.